3) Only the points value of the activated summit will be counted, summer or winter bonuses will not be included as they are already used for activator awards. 4) The rules for chasers will apply to the chased summit i.e. 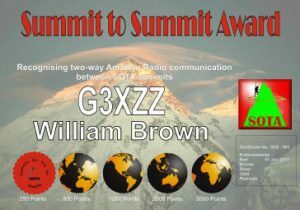 the summit may only be counted for the award once per day. 8) Award qualifying points values are 250, 500, 1000, 2500 and 5000. Additional endorsements will be available for 10000 and upwards.